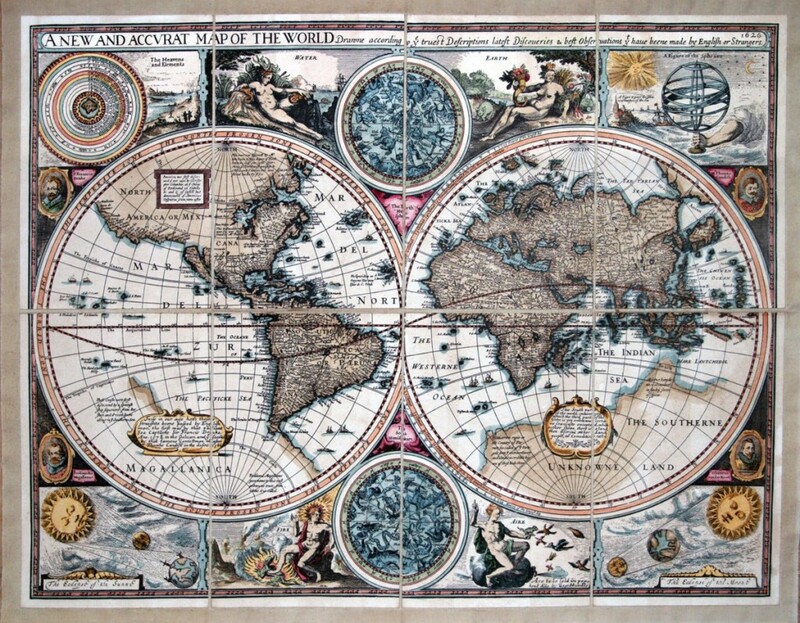 During the 17th century the British map-maker J. Speed earned his place among the experts that contributed to a century of re-birth in the science/art of map making. Even though there are not many well known works by this artist, A NEW AND ACCURATE MAP OF THE WORLD is a most remarkable result of his efforts. This planisphere is characterized by its array of allegorical figures. Water, fire, air and earth are represented by subjects that create a pleasurable visual effect. The depiction of the eclipses of the Sun and the Moon and the armillary sphere render the work fascinating. 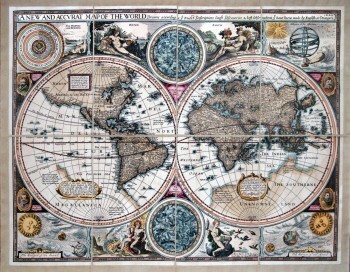 This artistic reproduction of an antique map was made using the same techniques, materials and instruments used for the original. Map is created from a zinc slab that is mounted on a wooden base and printed by hand, a piece at the time, on a press with a limited production size of 20 pieces each time. Map is printed on cotton-paper panels which are glued and mounted on a cotton cloth background "a stacchi" (slightly separated from each other), in order to allow for folding and easier transport. Finally, map is water-colored by hand, making it a truly unique piece, worthy of the original vintage map.